Choosing the right refinisher is important. Make a poor choice and you could be in for trouble. We actually see a fair amount of newly refinished tubs with streaks or where the topcoat is peeling. The problems usually stem from improper surface preparation and poor quality materials. Here are some things to look for in a refinisher. Quality Materials: The quality of the materials makes all the difference. Using inferior products increases the chances the finished product will peel or chip. We frequently get calls from customers who have had their tubs refinished with inferior materials. The finish is peeling or cracking. 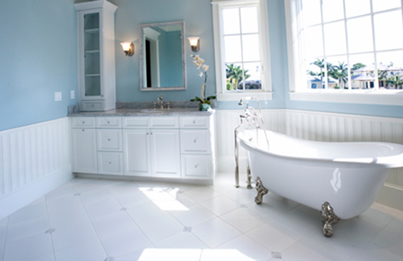 A tub that has been refinished with quality materials will last for 15 years or more if well maintained. "You get what you pay for" is very true with refinishing. A professional refinishing job will save you time and money. A poor refinishing job can cost you extra time and money along with a large dose of frustration. Before taking the lowest bid, make sure you ask all these questions. You will "get what you pay for" with refinishing! The key to good bathtub refinishing is getting the new finish to "stick" to the old surface. Ask about the refinisher's technical process. What is the exact procedure used? Do they acid etch? Do they use a bonding agent? What kind of coating do they apply? Any bathtub refinisher using acid to etch the surface is using old and potentially dangerous technology. Bath Doctor does not acid etch! We use a proprietary bonding process, which has proven to provide better results over time than acid etching. The long-term appearance and feel of your refinished surface will largely depend on the top coating that is applied. Epoxy is old technology. It is very durable, but it tends to yellow and turn chalky in appearance over time. Bath Doctor uses only acrylic top coatings. Is the refinisher licensed and insured? Is the price too good to be true? BEST QUALITY - our materials and skills are second to none and we don't skimp on the preparation work which is the key to a long lasting job. BEST SERVICE – we are a single-truck operation. That’s right the Bath Doctor does all the jobs himself personally. However we do have a full time office able to service our customers promptly and reliably; not just an answering machine. BEST PRICE - you will find our prices to be competitive. And, considering the high quality of our service, to be the best buy available. Call us now for more information at 203-699-8700 or toll-free at 866-966-BATH.